Laura Benjamin is the first openly transgender woman elected to a city council in Wisconsin. She is the owner of Satellite Six, a marketing company. View more photos at LeaderTelegramPhotos.com. 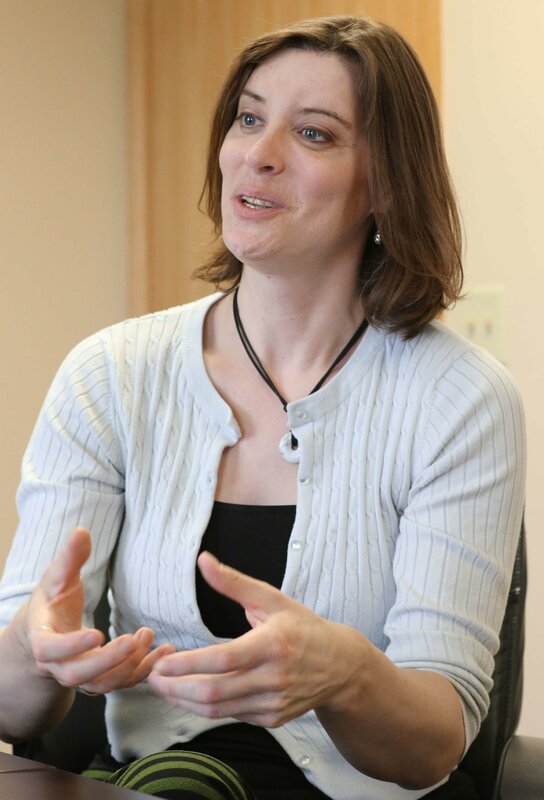 Early in her campaign Laura Benjamin had to decide whether being a transgender woman would be a key part of the race for the Eau Claire City Council. Some on her campaign wanted to emphasize how electing a transgender person would be a milestone for the city, but Benjamin opted to run on a platform of being pro-business and socially progressive. “I didn’t want it to be the reason to vote for me,” Benjamin said of her gender identity. The 38-year-old founder and president of local marketing firm Satellite Six instead spoke enthusiastically about encouraging entrepreneurship so small businesses can grow in Eau Claire. “I believe in socially responsible business,” she said, citing software company Jamf and magazine Volume One as a couple examples of homegrown businesses that have had a positive impact on the community. She’d also advocated for attracting and retaining skilled workers and addressing a shortage of affordable housing. And a piece of her campaign pushed for local policies to protect lesbian, gay, bisexual and transgender people in Eau Claire against discrimination. Being transgender did come up at campaign events, Benjamin said, and she’d openly discuss it. She fondly remembers a very positive encounter when a transgender boy from a local high school hugged her and thanked her for running. “Not more than a week later it became the flip side of that,” Benjamin said. Three weeks before the April 2 election, a person posted a meme to Benjamin’s Facebook page about her gender and threatened to spread it wide. But Benjamin found it to be an empty threat as she’s open with family, friends, colleagues, clients and others about being a transgender woman. “This is not news to anybody that’s ever talked to me,” she said. In a March 25 video and a follow-up post on March 27 on her campaign’s Facebook page, Benjamin spoke about being transgender for those who didn’t already know that about her. “Yes, I’m transgender, but that’s not the most important thing about me,” she said in the video. On April 2, Benjamin won one of five at-large seats on the City Council, getting support from 5,394 Eau Claire voters. She came in fourth in a 10-person race. She’ll be sworn in on Tuesday in a meeting where council members choose which committees they hope to serve on. Though she’ll be a newcomer to the group, Benjamin is hoping to secure a spot on a committee or board that deals with local economic issues. Born biologically a boy, Benjamin recalls having doubts about her gender as early as 4 years old. “It just didn’t feel right,” she said. But not knowing what transgender was at the time, Benjamin buried those feelings and had a lot of denial in her childhood. Presenting as a boy through her high school years at Eden Prairie, Minn., Benjamin came out as transgender in her first week attending UW-Eau Claire in 1999. But three years later she buried that and went back to living as a man. “It’s a challenge and a journey to be honest with yourself,” she said. Benjamin transitioned again in 2004 making her appearance feminine and wearing women’s clothing for about five years. But that was followed by returning to the closet, marrying a woman and living as man and wife. In 2016, Benjamin found herself experiencing gender dysphoria, sinking into depression tied to the disconnect between her biological gender and who she felt she really was. “I gotta do something about this,” she recalled thinking. Benjamin went to counseling in hopes of doing better than she did when she grappled with her gender before. She mulled different measures including dressing and presenting herself as a woman or being “gender-fluid” — not identifying as strictly male or female. But after several months of counseling and soul-searching, she decided that being a woman was what she truly wanted. After the transition to being a woman, Benjamin said the self-questioning that had been plaguing her life before went away. Her marriage did end in divorce, which Benjamin attributed to multiple problems the couple had but she did say the transition to being female was a factor. Benjamin said she’s found emotional support from her ex-wife, her two children and the local business community. Two years ago she sent an email to Satellite Six’s active clients, informing them that she’d be using a new name, referring to herself with female pronouns and transitioning to become a woman. “I was greeted with a lot of support,” she said. During the campaign and through the election, she heard from LGBT supporters glad to see their community represented in city government and other people who said they simply liked her politics. Benjamin said the positive reaction she got far outweighed negative comments tied to her gender. Benjamin has made history as the first openly transgender person elected in Eau Claire and she is believed to be the first transgender woman to serve on a city council in Wisconsin. “It’s definitely a great day when another person is in a visible position like that,” said Megin McDonell, executive director of Fair Wisconsin, a Madison-based political advocacy group for LGBT people. “We aspire to see more LGBTQ people represented in all facets of society — elected office, leadership roles in institutions,” McDonell said. According to McDonell and numerous news articles, the first openly transgender man to win election in Wisconsin is Vered Meltzer, who won a seat on the Appleton City Council in April 2014 and has been re-elected twice. Breaking that ground came as a surprise for Meltzer, who said he assumed a progressive city like Madison had already elected transgender people to local office by then. Meltzer represents a district including the city’s downtown and Lawrence University, where Meltzer graduated from in 2004. Like Benjamin, Meltzer chose to focus on issues facing Appleton during the elections instead of his gender. “The fact that I was trans was a thing on the side,” Meltzer said. Among his first efforts in office was to allow city residents to raise chickens and improving communication between the city government and constituents. Meltzer also cast a vote supporting an anti-discrimination policy in Appleton that included gender identity and gender expression. “Regardless of how I identify, I would’ve voted for it,” he said. Benjamin is looking to advance a similar policy in Eau Claire as she is concerned that state and federal laws aren’t strong enough to protect people from being terminated from their job for being transgender. McDonell said a handful of Wisconsin cities, including Madison and Milwaukee, have approved local laws like that. Wisconsin did serve as a pioneering state in 1982 when it approved a law prohibiting discrimination based on sexual orientation when it comes to housing, employment or public accommodations. “Unfortunately those protections don’t explicitly address gender identity or expression,” McDonell said. And while court decisions and executive guidance have created protections for LGBT people on the federal level, she said, groups like hers still desire a law clearly establishing those.